Obama seems to keep hitting home runs during his first 100 days of his Presidency. This time he overturns one of the Bush rulings that went into effect just before President Bush left office. It was a regulation that made it easier for federal agencies to skip consultations with government scientists before launching projects that could affect endangered wildlife. At an enthusiastic reception at the Interior Department, scientists applauded Obama's memorandum that suspended the regulation while ordering a review to determine whether it promotes "the purposes of the [Endangered Species Act]." 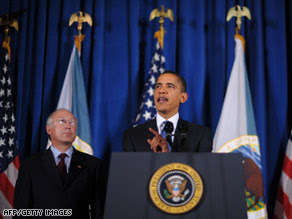 With this action, President Obama helped to celebrate the 160th anniversary of the Interior Department on Tuesday.